Susan Pigg with the Toronto Star, published the following article regarding Toronto’s ever-growing skyline. “Toronto’s stretch into the skies is capturing the attention of the world. Tall-building development here is outpacing every other city in the Western Hemisphere with 15 skyscrapers exceeding roughly 45 storeys now under construction, according to a new study by the Council on Tall Buildings and Urban Habitat. That means by 2015, Toronto will be home to 44 highrises exceeding 150 metres, more than triple the 13 skyscrapers that graced the city’s skyline in 2005, says the Chicago-based clearing house on all the latest in tall building design and construction. In a report titled “Canada Rising,” the well-respected council points to the Great White North’s fast-paced push upwards in just the last eight years. And it credits Toronto with “spearheading a countrywide interest in tall building development” that has seen a dramatic shift away from simply highrise office towers to homes in the heavens that are transforming the look and feel of Canada’s major cities. “There’s no doubt that Canada is at the forefront of discussion around how to create more vibrant urban centres, increase density and build more sustainable cities,” said council spokesperson Kevin Brass. So far at least, the 37-year-old First Canadian Place remains the tallest building in Toronto at 298 metres, the council notes. But not far behind are newcomers Trump International Hotel and Tower at 277 metres and Canderel’s 272-metre condo project at College and Yonge Sts., touted to be Canada’s tallest residential building. Workers have just started pouring the 48th floor of what will be a 78-storey tower with nearly 1,500 residents — so unusually big for a condo project that it will have two condo corporations so residents can be moved in in two phases starting next summer. “Ten years ago, the average highrise was 30 to 35 storeys. Today, 60 is becoming commonplace. 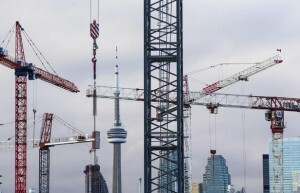 Those heights are going to become the new norm as (building) sites become more scarce,” says Riz Dhanji, vice president of sales and marketing for Canderel Residential Group. In just the last eight years, 25 buildings of more than 150 metres have crept up across the country compared to just five between 1995 and 2005, says the council. By the end of 2015, the number of buildings higher than 150 metres across Canada will have almost tripled since 1995, from 26 to 74. Toronto ranks No. 1 in Canada with 30 buildings over 150 metres while Calgary is runner up with 14. Vancouver has just three buildings exceeding roughly 45 storeys but is due to get a 4th in 2014, in suburban Burnaby.